The updated version of the award-winning Defend Your Life, offers lots of new vitamin D information. Get the latest vitamin D research. Discover vitamin D’s role in preconception through early childhood. Author Susan Rex Ryan examines how adequate vitamin D supplementation may decrease your risk of developing medical conditions including autoimmune diseases, bone conditions, and cancer. 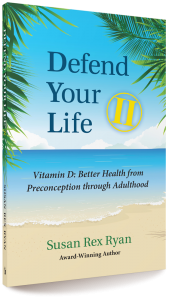 And, of course, the popular Vitamin D Wellness protocol is included in Defend Your Life II! Are You Predisposed to Depression? 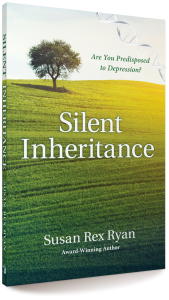 The new book Silent Inheritance explains how you can empower your life by understanding how to cope with inherited depression. This self-help book, available in print and electronic versions — in easy-to-understand language — addresses depression with straight talk. Learn how to find out if your DNA indicates predisposed depression. Understand how your environment may influence your DNA. Award-winning author Susan Rex Ryan shares her self-help success as well as her knowledge about major depressive disorders and how to overcome the stigma of depression. The Mom’s Choice Award-winning book Defend Your Life explains how you can empower your life by taking a safe and inexpensive daily dose of vitamin D. This self-help book, available in print and electronic versions, addresses recent, credible medical research — in easy-to-understand language — about vitamin D’s wide range of potential health benefits including: decreasing the risk of arthritis, autism, cancer, contagious illnesses, diabetes, heart disease, multiple sclerosis, and thyroid disorders. Adequate vitamin D in your body also may improve athletic strength and dental health as well as slow genetic aging. In addition, Defend Your Life discusses vitamin D partners including vitamin K2. 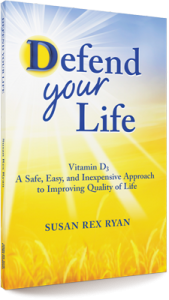 Award-winning author Susan Rex Ryan shares her self-help success as well as her theory about how you can to attain optimal vitamin D status and easily “defend your life” by preventing disease and enjoying better health and quality of life. When my copy of “Defend Your Life” arrived from Amazon, I could not put the book down. The number of medical studies linking vitamin D3 and the prevention of so many types of diseases including autism,cancer, and MS are astounding.I even learned how vitamin D3 can affect the gums and teeth in my mouth! This book is well-written, easy to read, and includes personal stories and insights that only add to the reader’s enjoyment. Highly recommend!